I recently made a discovery that I want all you coconut lovers to know about. It’s Trader Joes Frozen Coconut Chunks. Now, I know that coconut is one of those foods that many people either love or hate. There’s not much middle ground, so if you’re not a fan, you can stop reading now. I have a list of favorites that I always try to buy when I’m at TJs, but since my visits are less frequent now, I hadn’t seen this product before. I’m a lover of all things coconut, so was excited to see that this is just what the package says, “JUST COCONUT CHUNKS”, nothing added. No preservatives, chemicals, sugar or salt. I LOVE THAT. I brought it home and popped the bag in the freezer, but not before taking out 8 or 10 chunks and putting them in a Ziploc bag in the refrigerator. (My husband loves coconut too.) A few hours later, I took them out and gave them a try. Lo and behold, they tasted like fresh coconut, just as you would imagine. I was a little concerned that the texture might be impacted by freezing, but I didn’t notice any difference at all. Here’s what the coconut looks like just out of the bag. This is only about half of the bag. The best part for me is that the chore of cracking open a whole coconut and digging the meat out is totally eliminated. I love this too! Think of the time and mess you’ll save. Here’s the nutritional info (below). More good news: I found many articles, like this one, praising the benefits of eating coconut. Raw coconut is rich in medium-chain triglycerides, a type of dietary fat that may encourage weight loss. It’s an excellent snack option for those looking for low carbs and high fiber. The rumors about its ability to promote weight loss are not thoroughly substantiated, but would be a nice bonus. And did you notice that it contains iron and protein too? I love that it’s a sweet and filling treat, with health benefits. Now I just need to get back to TJs and buy more to stock my freezer. Have you tried this coconut? What do you think? Do you have any favorite recipes that you make with it? Friday afternoon when we landed we met the kids and picked up our rental car from the airport. Our son, Kevin had already been in Scotland for a couple days and had a rental car too. We decided that we’d pay for an additional driver for each car so that each of the 3 couples would have the freedom to go somewhere on their own if they wanted to. It turned out to be helpful on a few occasions and the fact that a car that seated 6 people (plus luggage) would have had to be quite a bit bigger, we were glad that we didn’t get just one vehicle for all of us this time. 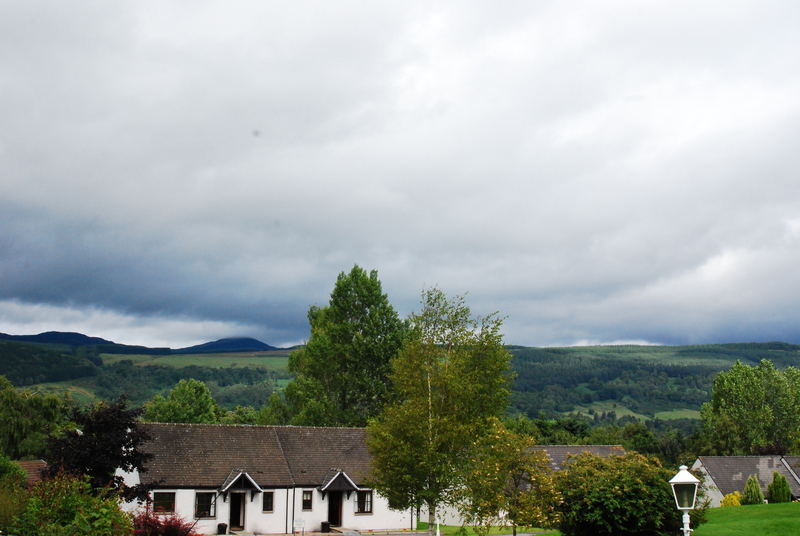 Our home base was in the small town of Aberfeldy, right in the heart of Scotland. The 6 of us were staying at the Moness Resort in a 2 bedroom time-share (with a sofa-bed in the living room). 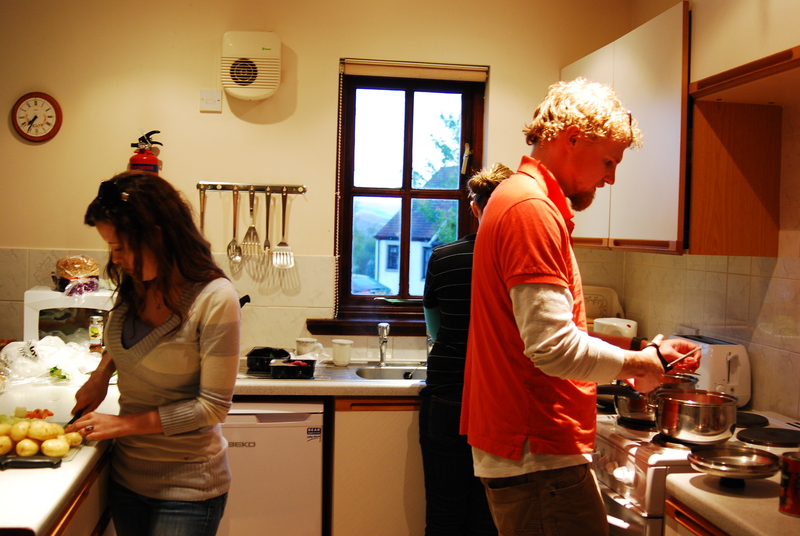 We had a functioning kitchen which saves on time and food costs when you can prepare a few of your meals at home instead of eating out all the time. On Saturday we all slept in a bit to try to catch up on sleep after our long travel days. We envisioned a relatively low-key day since we knew we needed to acclimate to the new time zone before the schedule got too busy. 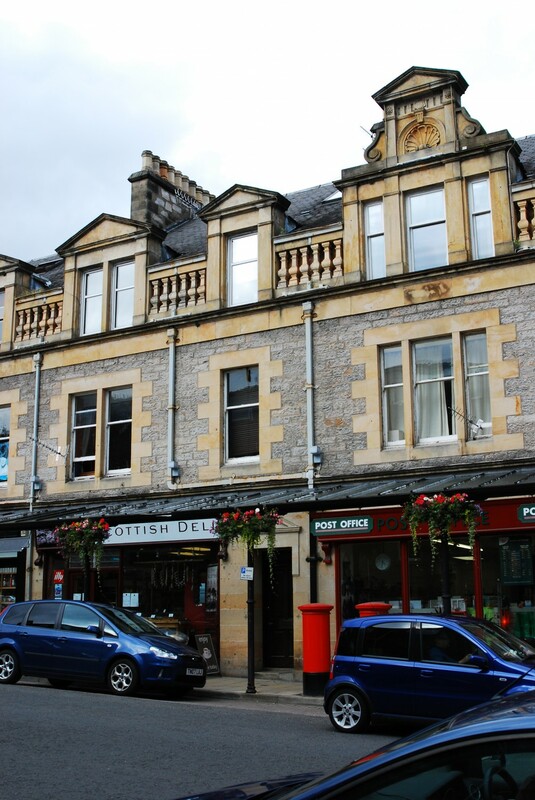 The plan for the day was to drive about 15 miles to do a bit of exploring in the town of Pitlochry. The young guys wanted to check out some of the whisky distilleries there and the rest of us just wanted to start discovering Scotland. When we got there we went to the Information Center on the main street and asked for information about how to find the distilleries. After we started walking Amy wasn’t feeling too well, so she decided that she didn’t want to do a long walk. I volunteered to stay in town with her since I didn’t have a huge interest in whisky and we sent the other four off on their adventure. 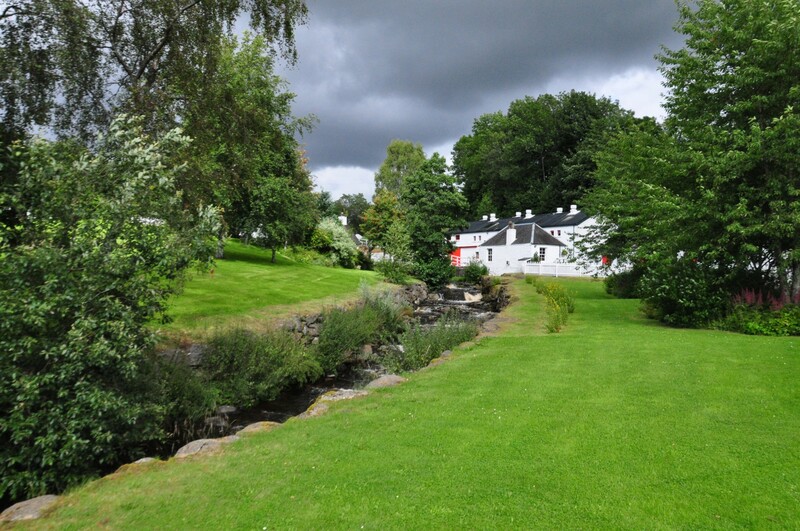 Here’s a photo (above) that Chelsea took on their hike (and I hear it was quite a hike) to the Edradour Distillery. This happens to be the smallest distillery in Scotland. You can read more about their story here. Since I wasn’t with them I don’t feel qualified to write about it, but I’m hoping that Terry (or someone) will give us their account of the hike and the tour that they went on. 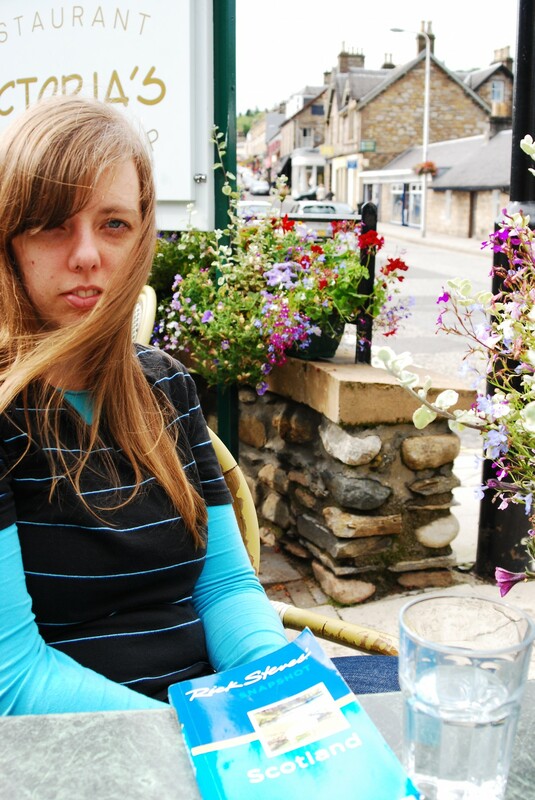 While they were exploring the world of whisky, Amy and I visited Victoria’s for a delicious cup of tea on their outdoor patio (note the Rick Steve’s Scotland Tour Guide on the table). Afterward Amy decided to go and nap in the car and I spent some time exploring the shops. Here are a few of the sights. 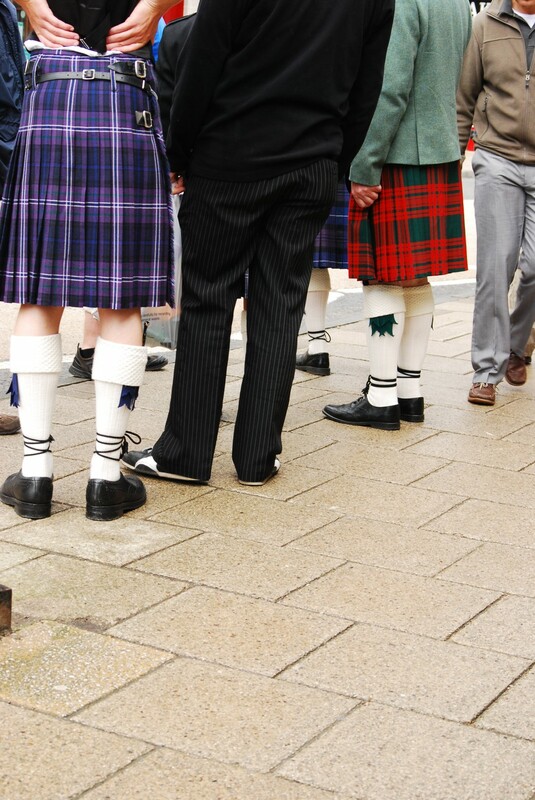 I thought these guys in kilts looked authentic until I heard them speaking German. Not sure if they were trying to blend in (which they didn’t) or if they were there for some other reason. IT’S ALL ABOUT THE FOOD: I visited a few other stores, but nothing really jumped out at me that I HAD to have. Then I spotted The Scottish Deli and their sign in the window that read “Scotland Deli of the Year 2011”. Despite Scotland’s reputation for having relatively bland, boring food, I had to see what this little place had to offer. 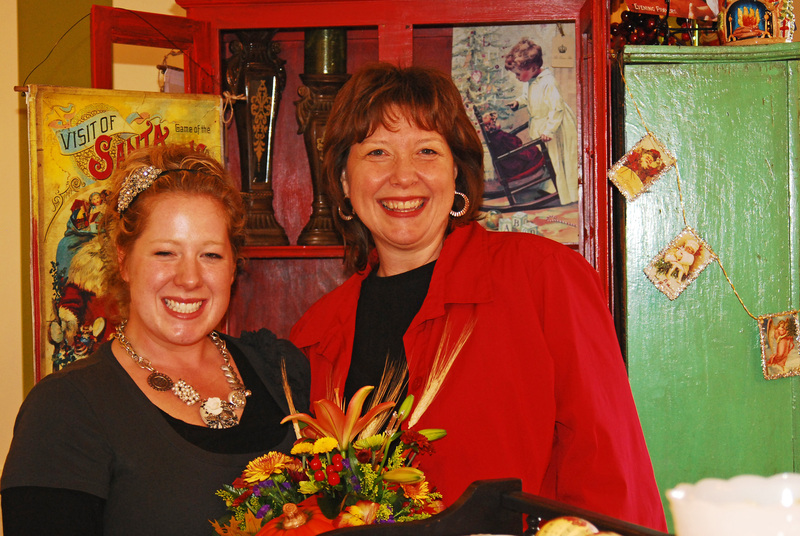 Inside the cozy shop that could only accommodate 2 employees and a few customers I found some wonderful surprises. The huge blackboard behind the counter listed about 30 different sandwiches available. There were unique treats like Smoked Local Duck with Chilli Jam or Dunked Local Smoked Salmon with Star Anis & Pink Peppercorn Mustard. It was such a creative variety that I was disappointed that it wasn’t meal time. I vowed to bring the gang back to have a meal here or to order some of their picnic lunches to go. While I was there I wanted to at least pick up some cheese and crackers that we could all enjoy in the room. I browsed the various artisan cheeses in the case and asked the woman behind the counter to wrap up a Scottish Gouda as well as an Isle of Mull Cheddar to compliment the crackers I found. Then it was time to pay. The register was in a corner of the deli area with a counter about 2 feet wide and there was already an older woman being served by the young man behind the counter. She was having some difficulty with her bag and needed to have her items transferred to a new one. Simultaneously I was paying for the cheese and crackers at the same small counter. Soon the older woman was finished and walked out of the store. Since I was waiting for them to give me my cheese, I stood at the counter, finalized my payment and looked at the clerks. They looked at me as if to say, “I think we’re finished. You can leave now.”. But I still didn’t have the cheese that they had wrapped up behind the counter. They both looked at each other and blurted out, “Oh no! Mrs. McDougall must have taken it!” The young woman tore out from behind the counter, ran out the door and down the street shouting for Mrs. McDougall while the young man apologized profusely about the missing cheese. A few minutes later the young woman returned, a little out of breath, with my purchase. She apologized again, we all had a good laugh and all was right with the world. 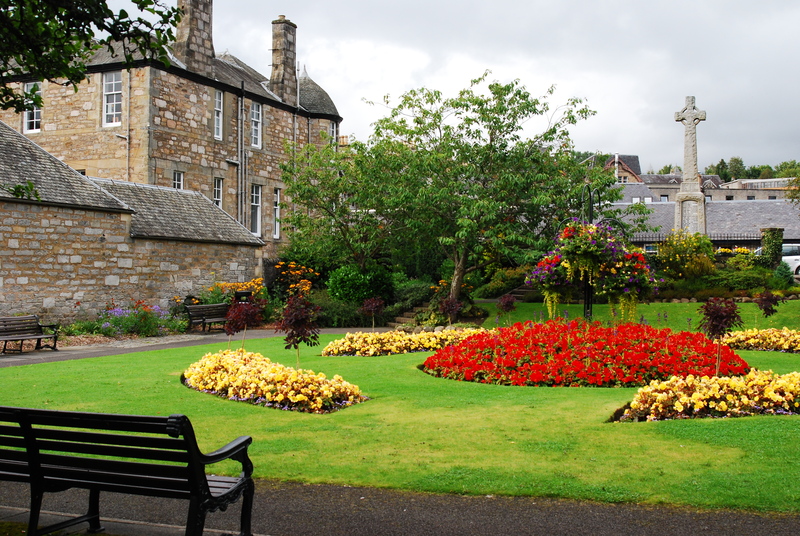 This is one of their beautiful garden areas in the town center. It’s a charming little town, well worth a day trip. Before we left town we headed for their grocery store, which was probably equivalent in size to a Fresh-n-Easy Market in Arizona. We picked up food for one dinner, breakfast each day and a few snacks and drinks for the week. With the itinerary we had, we knew that we wouldn’t be home much at meal time and we were right. We planned the food perfectly, with just enough to get us through the week. Here are some of our treasures. 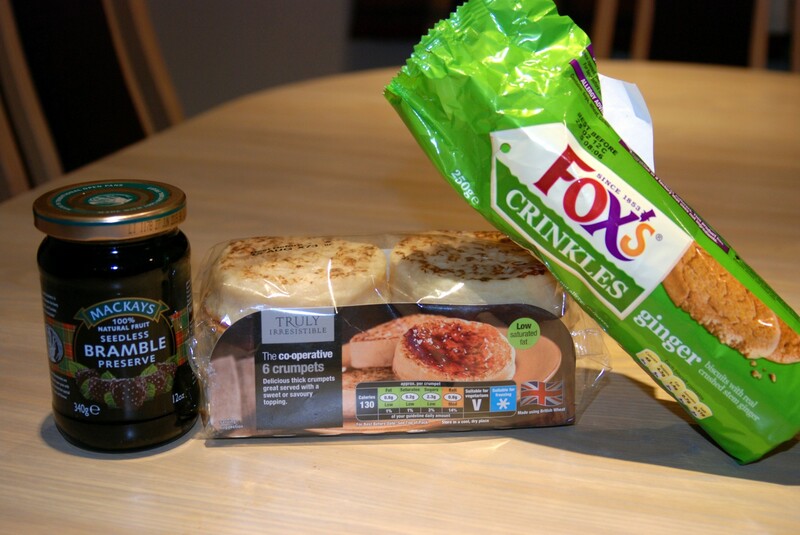 Bramble preserves (which could be blackberries or raspberries – delicious), Crumpets (these remind me of an English Muffin that’s not sliced-very tasty) and Ginger Crinkles (a crispy ginger cookie or “biscuit” as the Scottish call them). 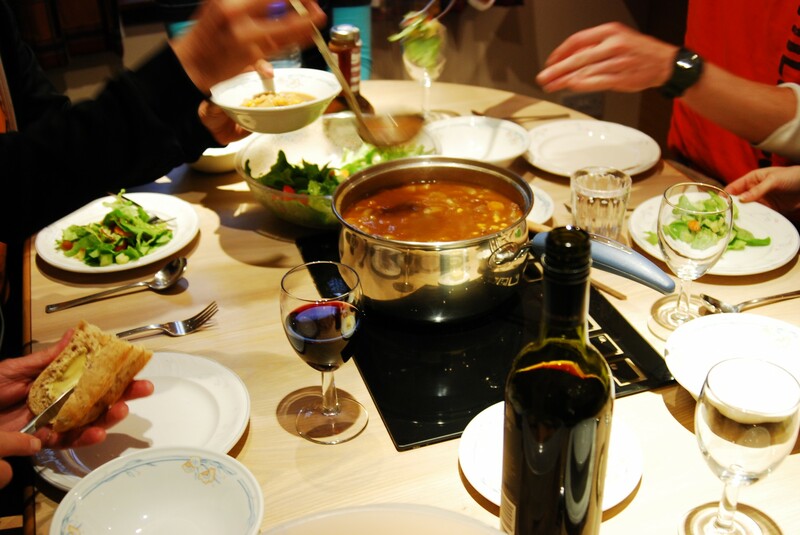 That night we enjoyed a home cooked meal of vegetable beef soup, salad, bread and wine. It was delicious! 1. Rethink the automobile: We have spent a majority of our vacations in the western United States which are filled with wide open spaces and sprawling cities where a car is almost necessary. In older areas on the east coast of the U.S. and “across the pond”, we’ve found that a personal vehicle isn’t always required because so many sights are within easy walking distance of each other. Plus sometimes its more hassle than its worth…with parking woes and navigating congested streets…consider other dependable modes of mass transit and walking, of course. 2. Every meal doesn’t have to be at a restaurant: Depending on your accommodations, it might be possible to buy a few items to keep in your room to save on eating every meal at a restaurant. You can also think about picking up a sandwich as takeout from a deli and enjoy your meal in the park. We usually plan to eat no more than 2 meals a day out. Often a late breakfast and early dinner work out well. Then, if needed, an evening snack in the room will hold you over until the next day. How do you handle your meals when you travel? Any tips for saving money without starving? For my fourth and final post in this series about La Jolla I thought I’d share a couple more fun photos and treasures that we discovered on our quick trip over there in July. In case you’re new to my blog, I need to tell you that although I currently live in the desert, I love the casual feel of coastal-cottage style decorating and I try to pretend that I live in a beach climate when I’m inside the house. 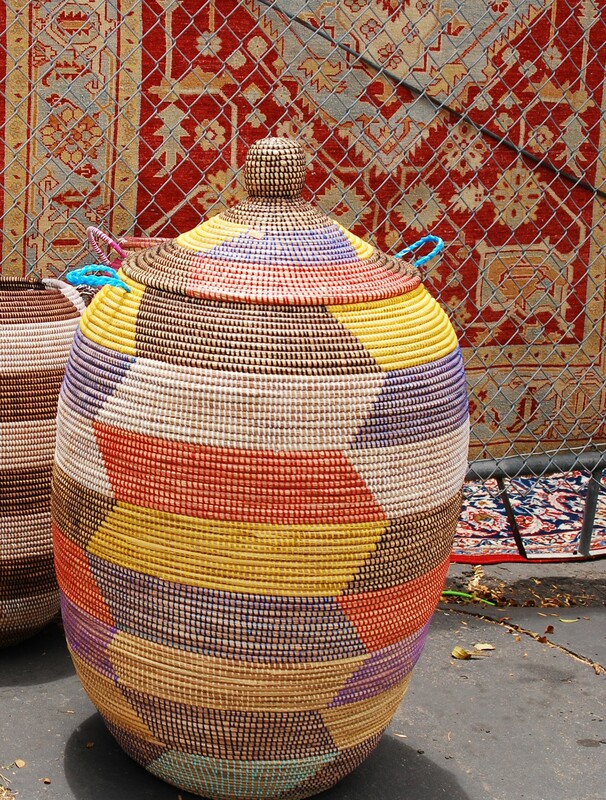 You won’t see adobe, saltillo tile, or southwestern decor when you visit. It’s blues, greens, sea shells and white painted furniture for me. So you can imagine why this caught my eye. 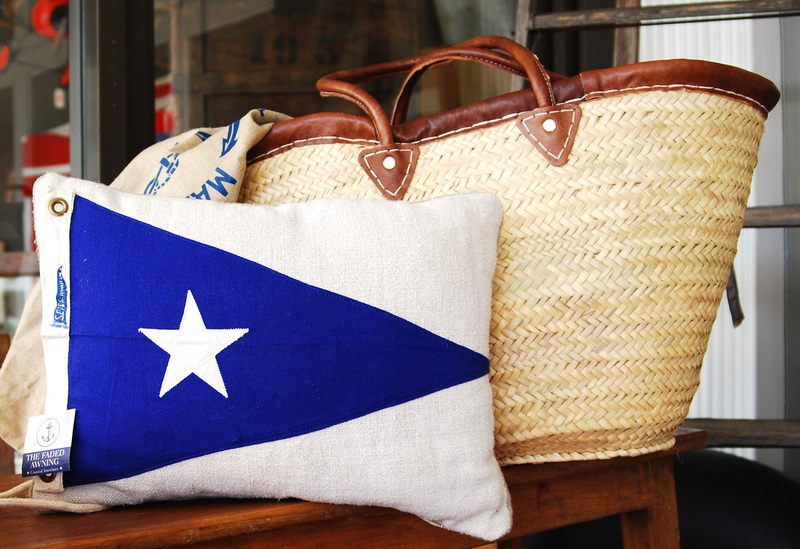 Tucked just outside the door at the entrance to the store I saw this wonderful pillow made with a vintage blue nautical flag. I just had to take a short detour to see what else they had inside and my sweetie was nice enough to patiently wait for me. Don’t you just love the simple beauty of that pillow? And how easy it would be to make some like this! I’ll have to add it to my craft idea binder. Once inside the store the space was a bit overwhelming and crowded, but I did see some wonderful pieces. Like this seahorse art which was 4 or 5 feet tall. 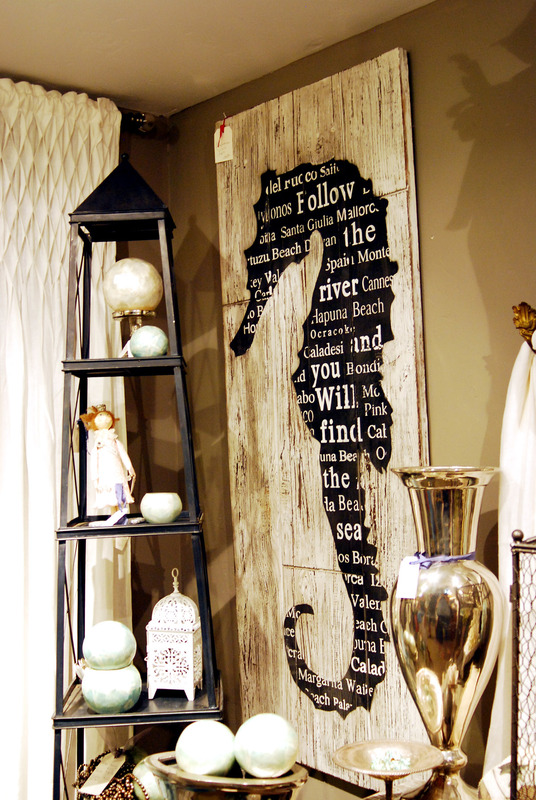 The silhouette was painted in black on weathered wood with the words stenciled on top of the black. I’m sure it isn’t as easy as it looks, but would probably be a fun project to try. Imagine the variety of similar pieces that you could do with the same basic format…starfish, fish, and other sea creatures with your favorite beachy prose or just random words to fill the space and a myriad of color schemes, like navy, or shades of beach glass, of course. Let me know if you decide to try it. I’d love to see how it turns out. Now, to say goodbye to this lovely coastal town, I thought I’d share a few photos that reminded me that we weren’t Phoenix. While driving down Mission Blvd. 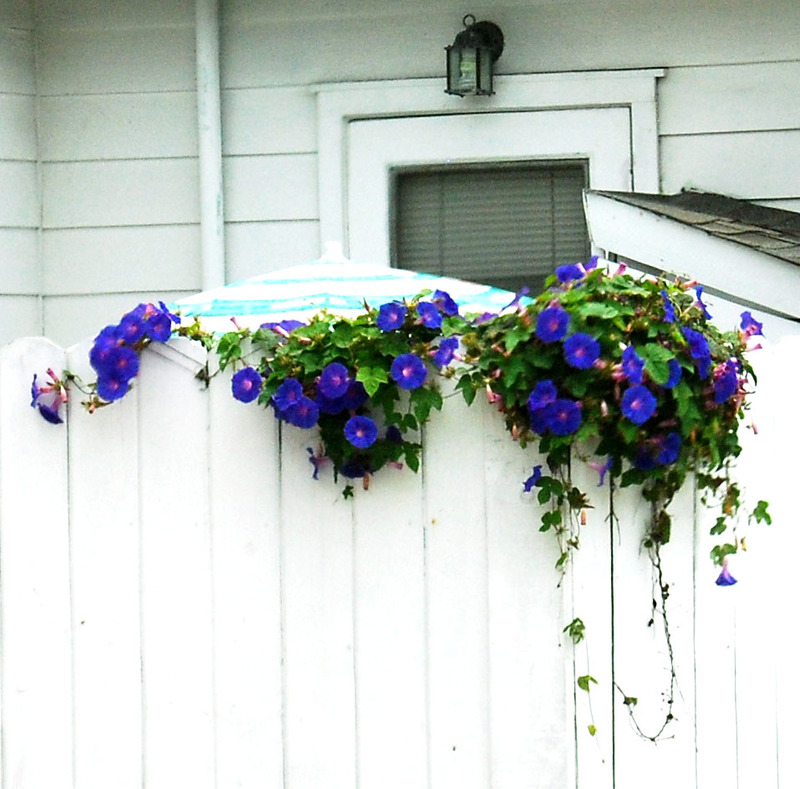 on our way out of town we passed this little beach house with these gorgeous morning glories covering the back fence. That shade of purple was so vibrant! 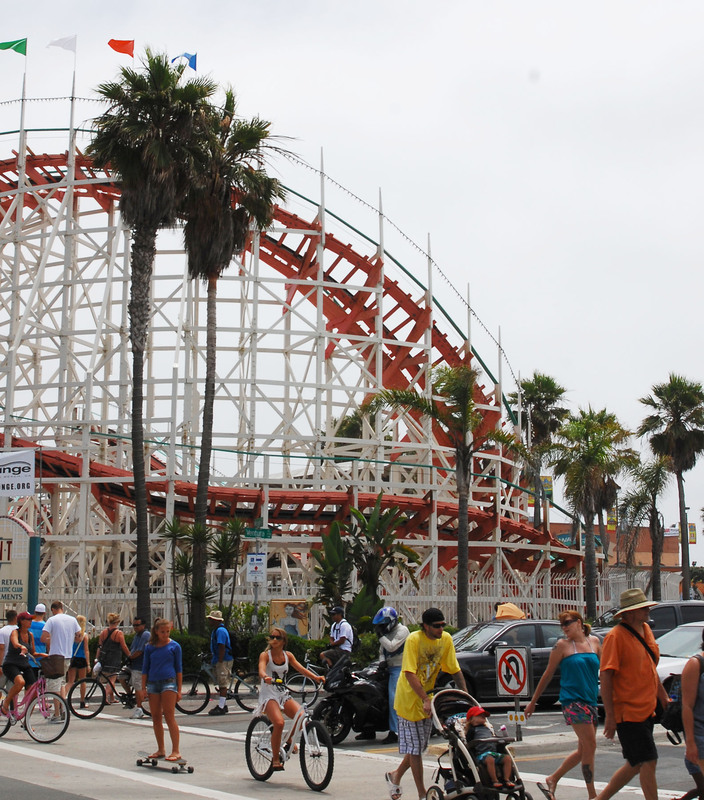 Did you know that just about 15 minutes south of La Jolla there’s a park with a roller coaster? It’s called Belmont Park. We didn’t have time to stop there, but it looked like it was hopping! Let me know if you’ve been there and if it’s worth a stop. And just how many different modes of transportation can you count in this pic? Those crazy Californians. And I just had to take this photo of the quintessential beach community. 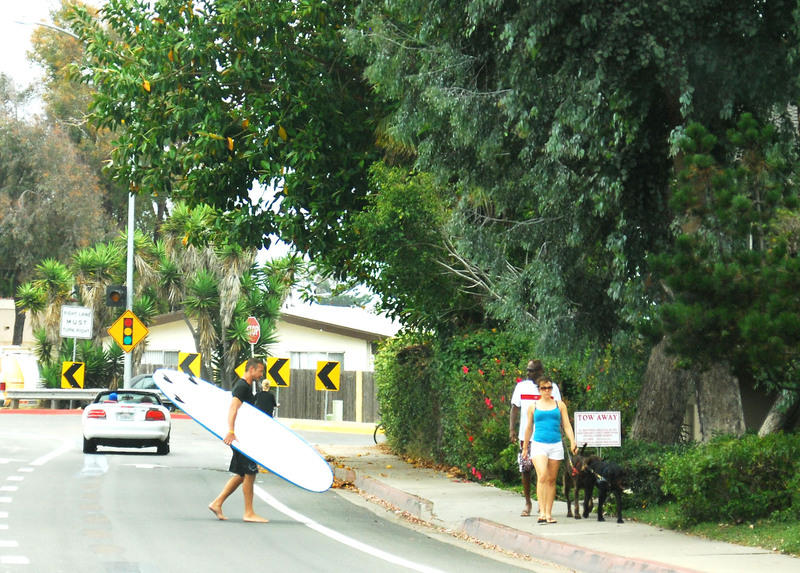 Where else will you see folks walking their dog, heading for the beach with their surfboard and driving in a convertible all in the same scene in the middle of July. In Southern California of course! So we bid farewell to La Jolla for now. I’m sure we’ll be back again, but not sure when. Thanks for coming along for the ride. Let me know where you’d like to go next. How does Scotland sound? It’s a little bit different than Southern California, but I’d say well worth the visit. Be sure to stop by again soon and see what we can find in Scotland and Ireland in the coming weeks! Or better yet, sign up to receive notification every time there’s a new post! After enjoying our free breakfast at the hotel I spent a little time surfing the web to try to get some ideas on things to do in our last hours there. I thought about heading downtown to check out some shops and galleries, since we didn’t do any of that on Saturday, but wasn’t sure when everything opened. 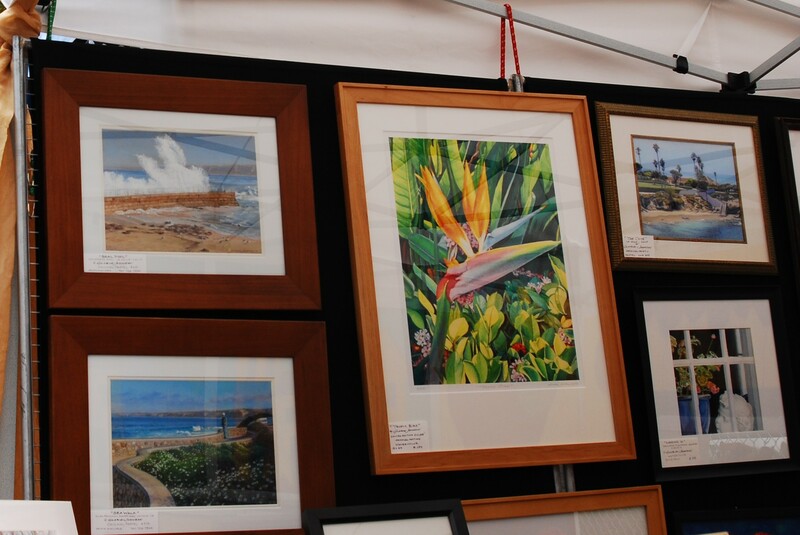 Then I stumbled onto a reference for the La Jolla Open Aire Market. Since it was in the middle of summer, I was thinking it might be a great place to pick up some delicious So Cal produce to take home with us. Turns out it was all that and so much more! 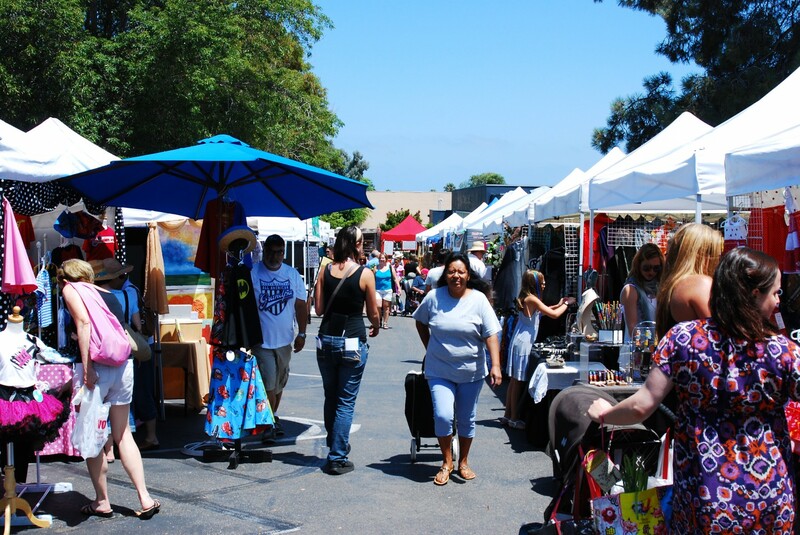 The Market is held every Sunday at the playground and all proceeds benefit the La Jolla Elementary School, just a block or so from downtown. What a brilliant way to bring in additional funds for our budget conscious schools! I would imagine it’s a fair amount of work to coordinate, but even if you only did it once a month or a few times a year I would imagine that you could bring in a decent amount of money for your favorite educational institution. Because of it’s location at the corner of Girard Avenue and Genter Street you run into a similar parking problem here as you do trying to get to the beach. 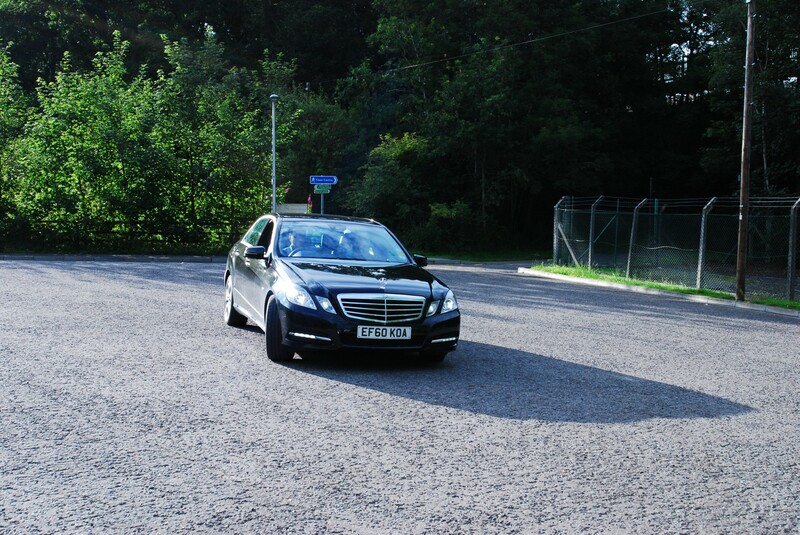 So Terry was nice enough to drop me off at the entrance and drive around until he found a parking space. Admission is free, which is always nice. Once we walked inside we were immediately flooded with vibrant sights, irresistible smells and perfectly lovely sounds. We enjoyed a talented guitar player and vocalist right at the entrance (sadly, I didn’t get his name). Some of the vendors that caught my eye offered fresh flowers, produce, children’s clothes, fine art photography, jewelry, home-made soaps and more. There was also a woman selling gorgeous orchids for very reasonable prices and I was so tempted to buy one. Unfortunately, I wasn’t sure how it would fare in our trek across the desert (or if it would make it through the border check going back into Arizona). Here’s an extensive list of their vendors as of the latest update. As we wandered around the booths I couldn’t help but notice the amazing scents that wafted through the crowds. 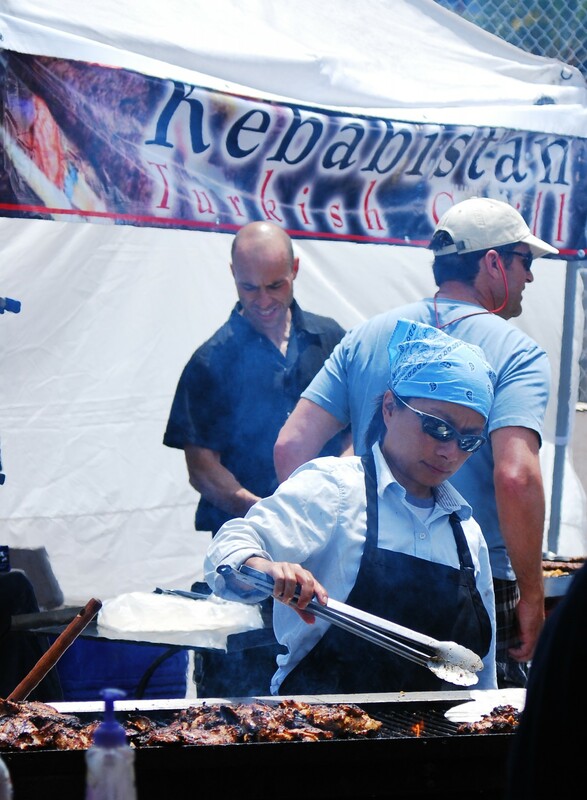 At the far corner of the market there was a concentration of food vendors that were obviously competing for our appetites. This was one time that I was disappointed to have had a free (boring) breakfast an hour or so before, because I really wished that I could justify buying one of the delicacies that was tempting my taste buds. Using all the will-power I could muster, I walked past the Turkish Grill and squeezed by the long line for the Creperie. 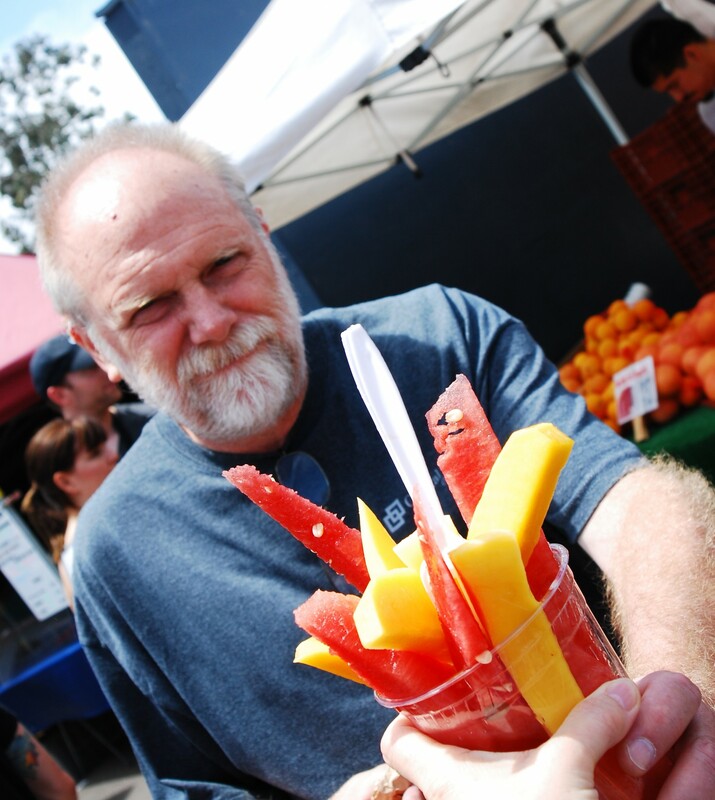 I was able to talk Terry into getting a huge cup filled with fresh sliced mangos and melon. Let’s call it dessert after breakfast. It was delicious! I’ll tell you, if I lived nearby I would do brunch every Sunday there until I had tried out all the food vendors. They smelled and looked THAT good! 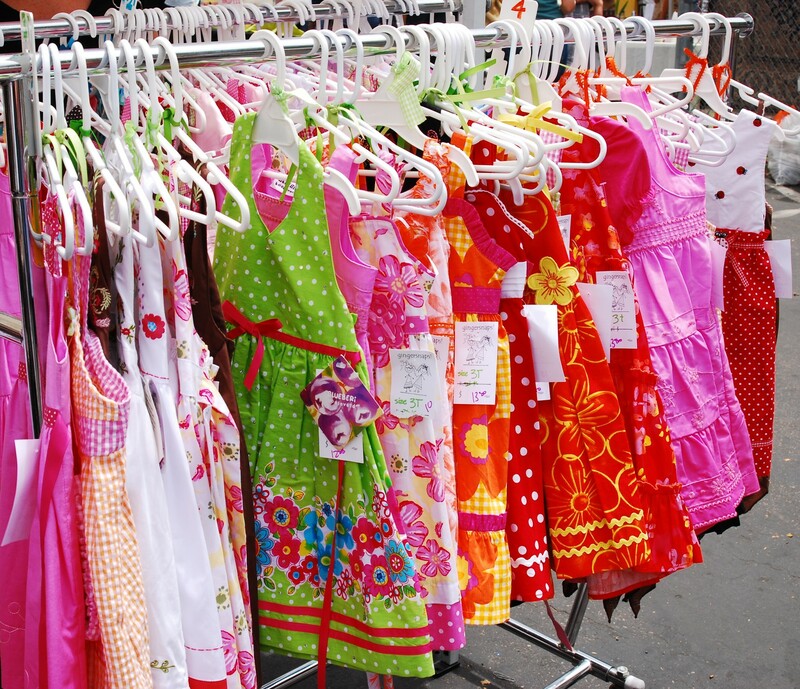 Then on the way out we spotted a booth called “Gingersnaps” with these adorable little girl’s summer dresses. I was SO tempted to buy one or two, except the fact that I don’t have any grandchildren yet, and didn’t have an immediate plan to attend a baby shower, so I wasn’t sure who I could give them to. I did think about my little friends, Emolyn and Elsie, but just didn’t have it in the budget to pick up something for them that day…and Terry would have thought I was crazy…maybe next time. 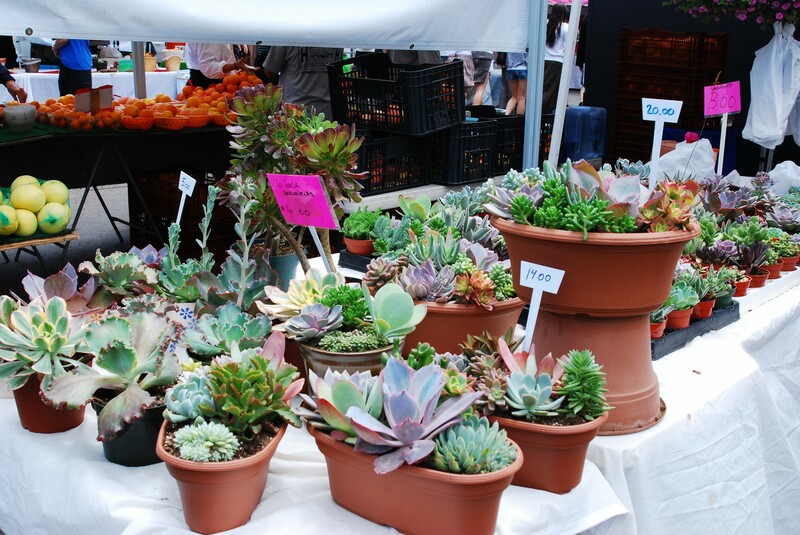 Here’s a small gallery of a few more enticing vendors from the Market. It was a such an unexpected adventure, chock full of treasures of all shapes and sizes. Oh, don’t I wish it was Christmas shopping season already! What am I saying! It’s Christmas shopping season all year long, but it’s also vacation season, so we had to save our pennies for the big trip in August. Hey, I’ve decided to add one more post about La Jolla, so stop by later this week to see what other treasures we found there. 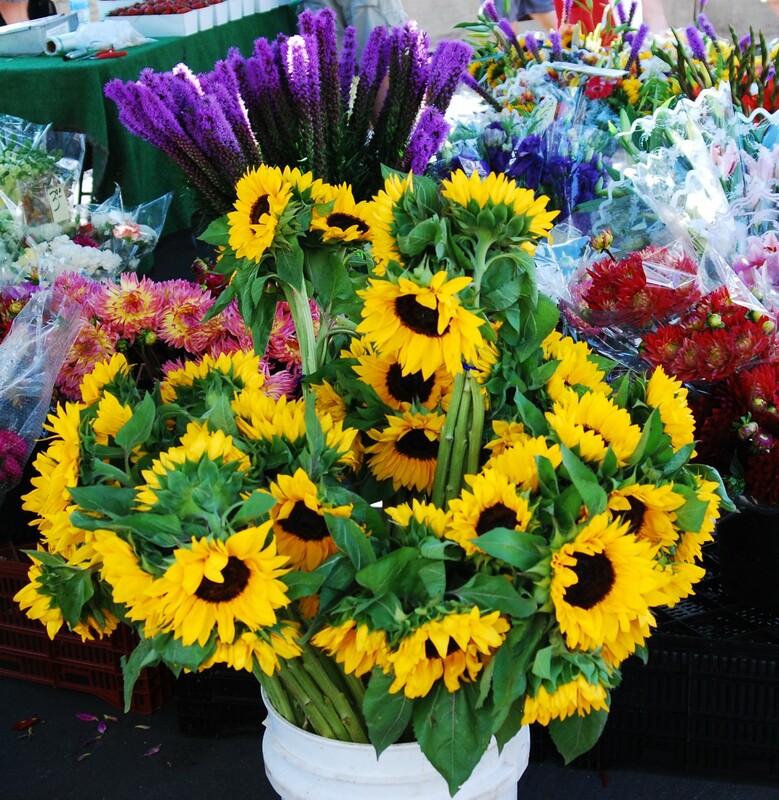 What’s your favorite open air market and what do you love to buy there? If you’re anything like me, you have a hard time making good food choices when you’re on vacation, especially when you’re eating out and have literally dozens of options, both healthy and unhealthy at your command. This summer our family is making plans for a BIG vacation in August when we’ll be going to Scotland for a week and Ireland for a week. And right now I’m in the process of losing some extra weight, especially before the trip, but also don’t want to go too crazy on vacation either. So, here’s something that might help all of us make better choices both at home and away. Today, my Frommers Travel Newsletter provided a timely link to MohrResults.com where I found this list of “47 Foods You Should be Eating“. 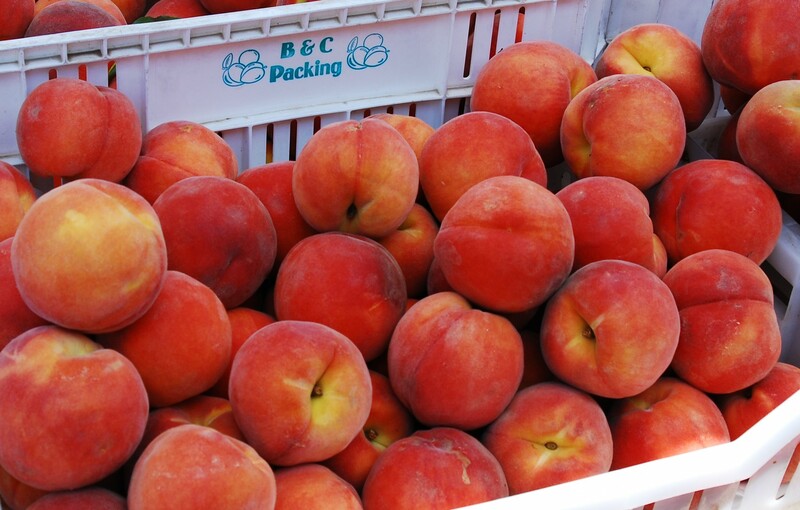 I’ve segmented the list into easy snacks for travel, then those with a higher likelihood of finding in restaurants, and last are the ones that you’ll probably find in the grocery store or in some cases, your local farmer’s market. I would recommend posting the list in the kitchen, adding it to your smart phone or iPod or carrying a physical list around with you until you have it memorized. Then on your next trip (or even your next local outing) when you’re sitting at a restaurant trying to decide what to get, look for one or more of these items in your food choices. And of course, when you’re at the grocery store, make it a game to see how many of them you can include in your weekly menu. I took my own inventory and discovered that I actually had 23 or the 47 items already in the kitchen! Yeah! I guess that means we’re off to a good start. Plus I picked up a few more at the grocery store today. Woohoo! Also don’t be afraid to try some foods on the list that may be new to you. Yesterday, (before I saw this list) I was at True Food Kitchen in Phoenix and tried their Tuscan Kale salad as a side dish and it was DELICIOUS! I’ve always been leery of kale, thinking for some reason that it would be too bitter, but this was amazing with a light sprinkling of Parmesan cheese and a wonderful lemon dressing. If there were places like True Food all over the planet, then we wouldn’t have to worry about eating healthy. They make it easy and scrumptious too! So today when I was at the grocery store, I decided to broaden my horizons and picked up some kale in the produce section. Then when I got home I did a little more research on this AMAZING super food. Check out this summary of the benefits of kale. Wow! Now here’s the cool part. 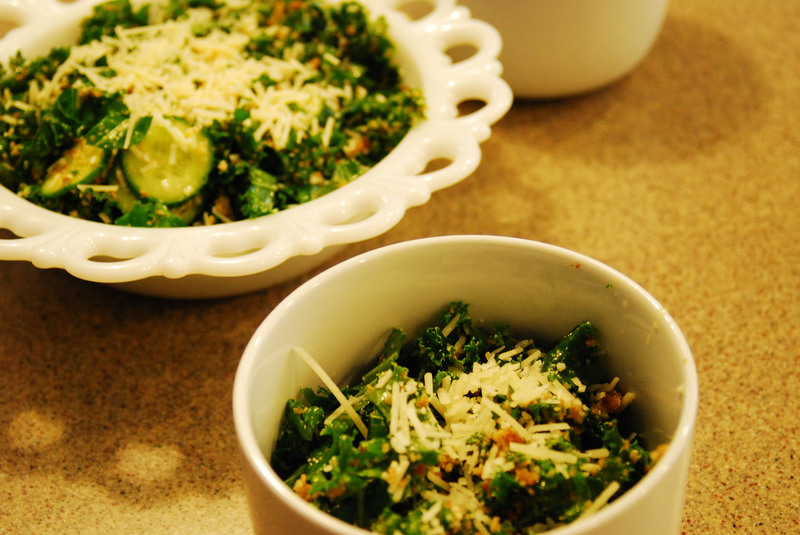 When I was researching, I also came across the Kale Salad recipe from True Foods here. So I made it for dinner! Here’s the picture of MY Tuscan Kale Salad (below) with the addition of cucumbers and a few minor changes (I added some lemon zest and Queen Creek Olive Mill Meyer Lemon olive oil (instead of EVOO) to the dressing) because I LOVE lemon flavor. Be sure to watch the short video showing how easy it is to make. In addition, when I googled “Kale Salad”, near the top of the list was another recipe from the food blog, “Oh She Glows“. The strange thing about that was that I had just finished reading my daughter’s blog post about her Top 5 Food blogs and she had mentioned this as one of her top five favorites. So here’s the list as promised. I hope it helps you to take a step toward healthier eating. 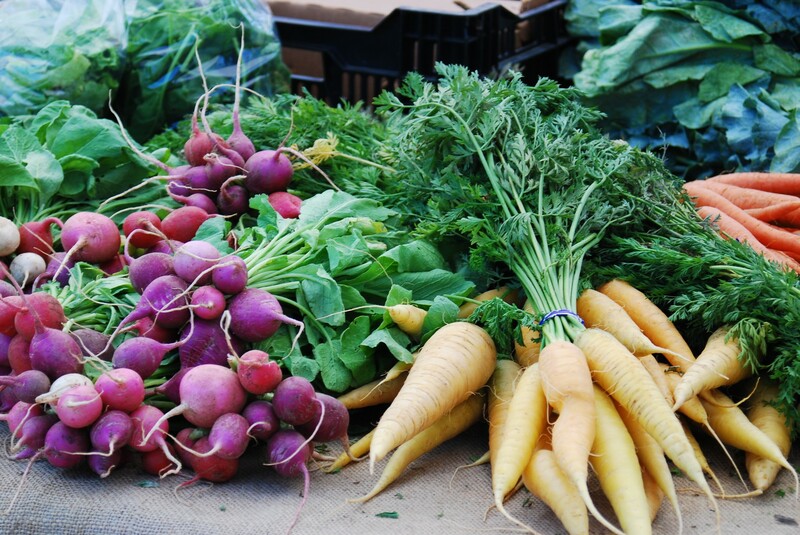 For me summer is always a better time to eat lighter when the temps are higher and the produce is fresher and less expensive. Let me know which of these are your favorites already or any ideas for ways to incorporate them in your daily routine. 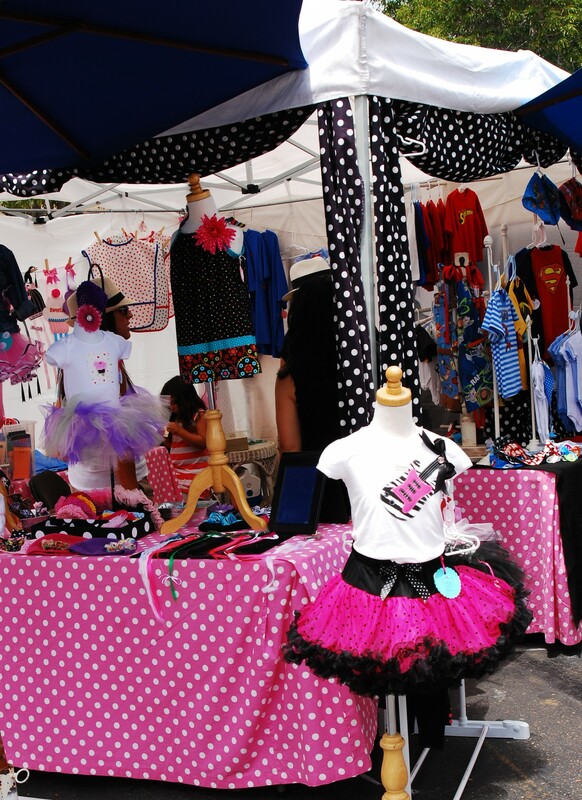 Today our family did some shopping at the Renegade Craft Fair in Los Angeles, California. 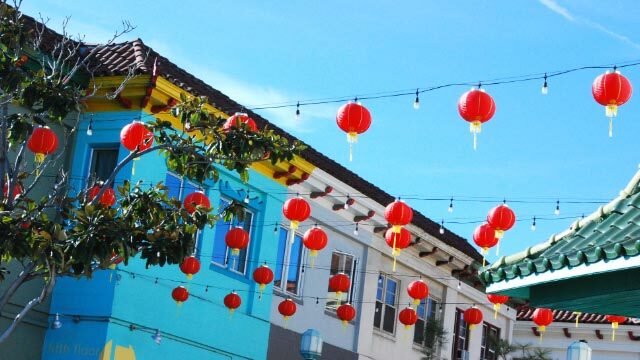 We drove through a slice of Chinatown on the way and I snapped this fun shot of the lanterns. 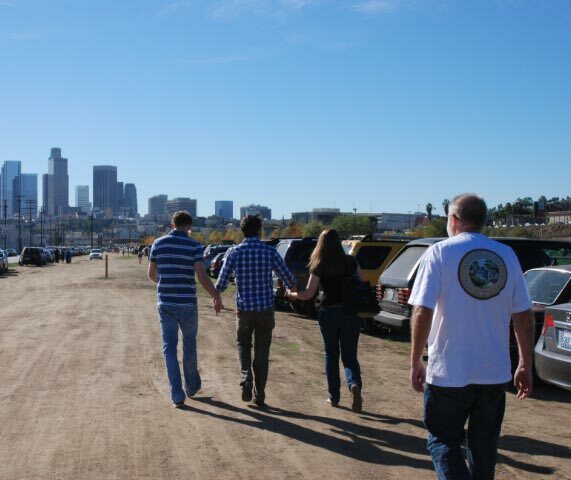 This is the group walking to the fair with the downtown L.A. skyline in the distance. Isn’t it cute how the 3 of them were holding hands? Don’t worry. It didn’t last long. There were some great handmade crafts there so I thought I’d share a few of my favorites and links to where you can find them. Sad to say that I don’t have time to track down the artist for these brightly colored felt pins, but love them anyway. If you like them, take a look at the links to all the artists here and see if you can find it. Look at these creative journals made from vintage hard cover books with blank pages added. These were made by Ex Libris Anonymous at http://www.bookjournals.com/. 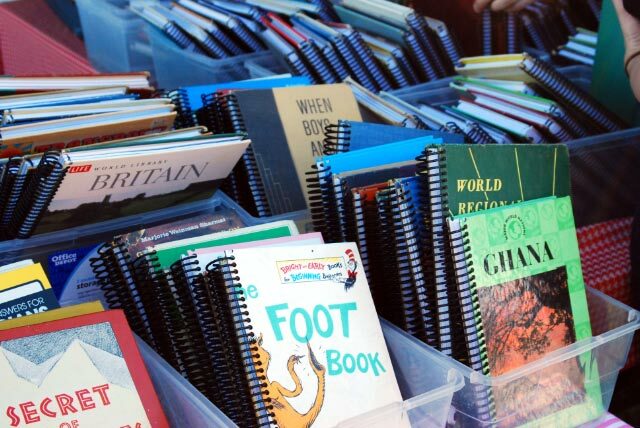 Just imagine how you could fill these pages! 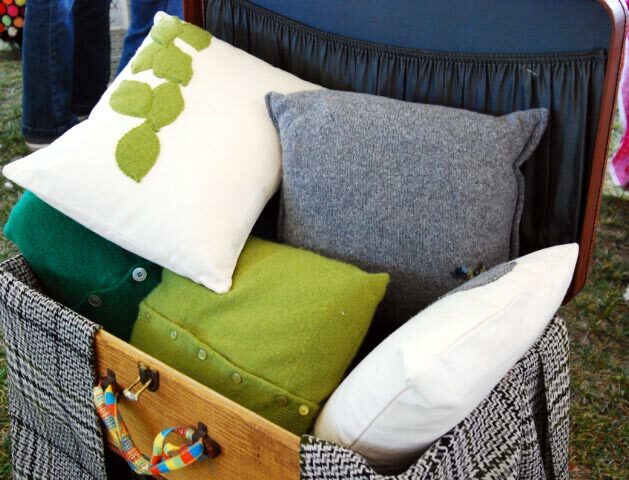 These pillows just gave me more inspiration for things I could make with my new sewing machine. 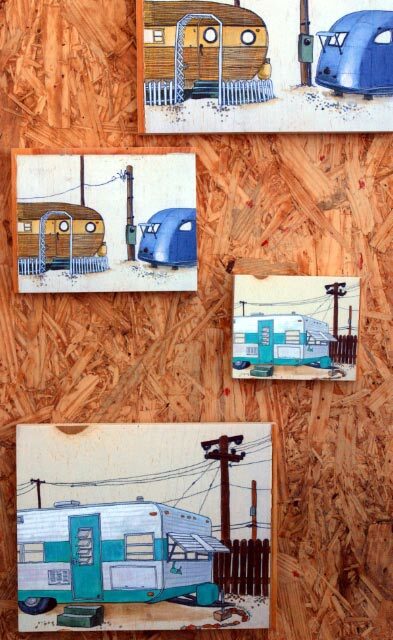 These wonderful vintage trailer prints were mounted on wooden blocks to be hung on the wall. The artist, “Chantalde Felice” said that she visited The Shady Dell, Bisbee, Arizona’s Vintage Airstream Hotel for her inspiration. Aren’t they adorable? 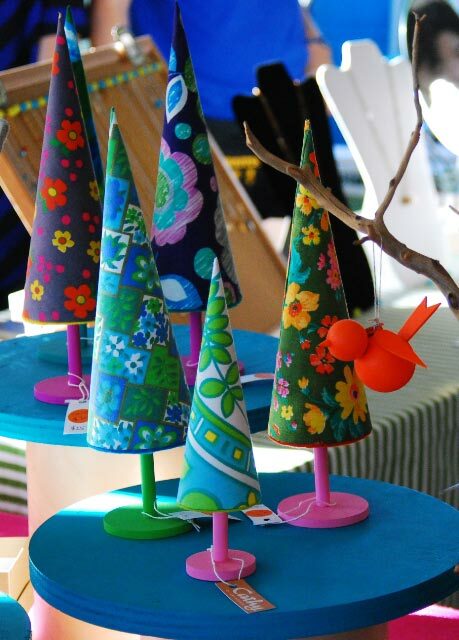 I fell in love with the colors and patterns on these precious cone-shaped trees! You’ll find them at Cathy’s of California. I tried to talk Terry into buying this Tshirt, but he wasn’t in a shopping mood. Don’t you think it’s kind of fitting for him? 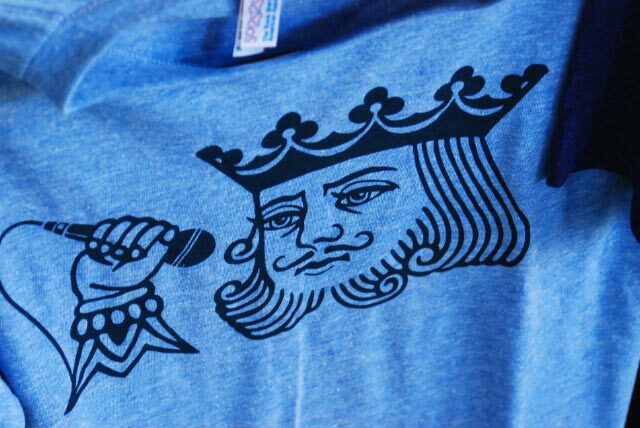 We can always order it or other cool ones later from DKNG Studios. 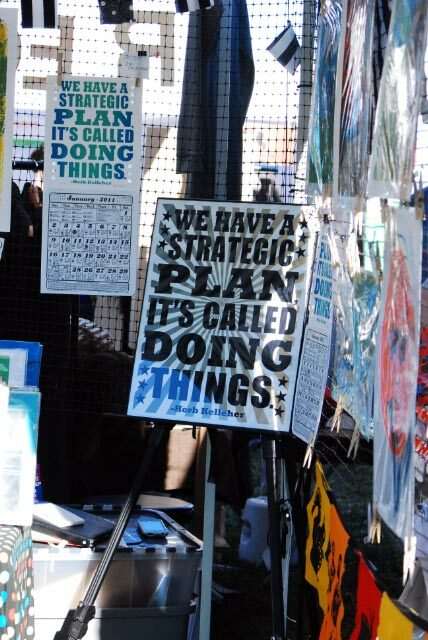 I thought this was such a wise statement…and excellent inspiration. Terry also bought me a pair of vintage typewriter key earrings for my Christmas stocking from “The Weekend Store“. They don’t look exactly like this, but they’re so cute nonetheless. Be sure to take a look at this website. There’s lots of interesting vintage inspired items. Sad news is the sale ended Sunday. But good news is that you should be able to find all of these artists online for your holiday shopping convenience. Thanks for coming along on my little cyber shopping trip. 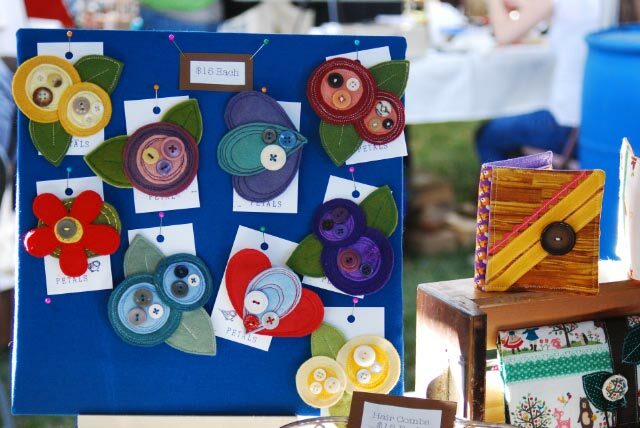 Don’t these handmade treasures inspire you to create something yourself? Which are your favorites? 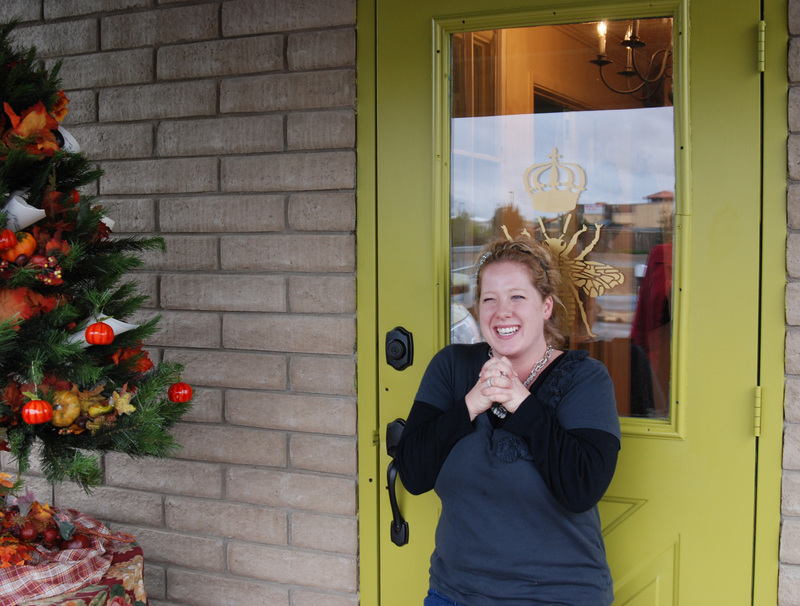 Recently a few friends and I had the chance to check out a cute and creative new shop in Prescott Valley, Arizona. It’s called “The Queen Bee” and we were there on their opening weekend! They didn’t even have a chance to get their sign up yet, so it will probably look a bit different when you go by. You’ll find it right on the main highway at 7273 E 1st St, Prescott Valley, AZ 86314. The owner, Kristina Lies happens to be my good friend Debbie’s daughter. Otherwise we wouldn’t even know about this sweet little gem in PV. When we were there we discovered just how creative Kristina really is. 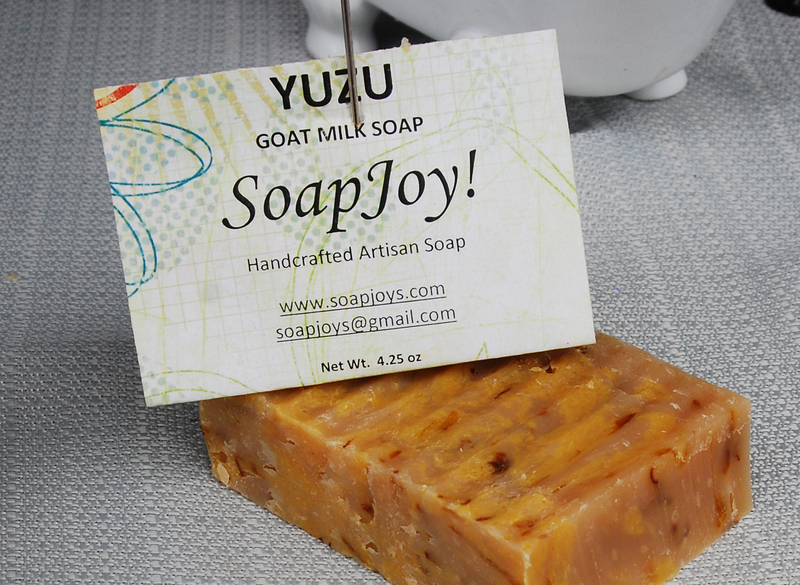 Many of the items in the shop are her creations or items that she has beautifully repurposed. We found out that she recently flagged down a truck full of old windows from a local high school renovation on their way to the dump. She has big plans to make some gorgeous architectural decorative pieces from those windows. Can’t wait to see what she does with them. 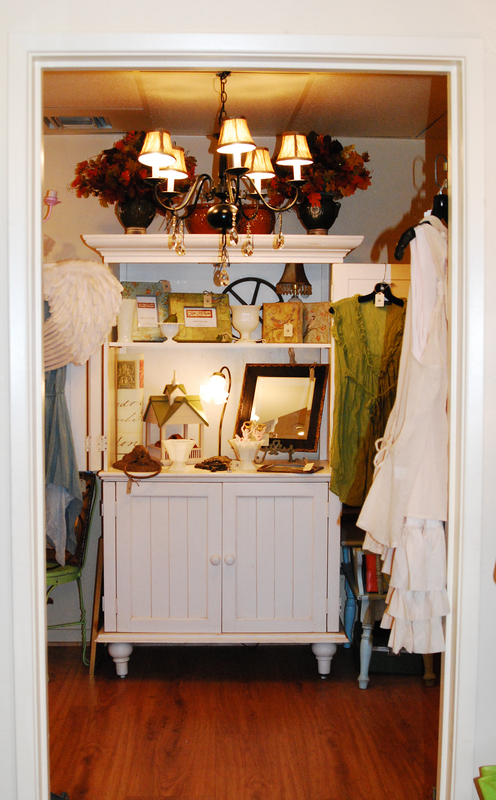 As you can see from the photos, even though the shop is on the smallish side she has a nice variety of items. Home decor, vintage postcards, clothes, even some wood furniture, and so much more. Be sure to click on the pics to see the detail. 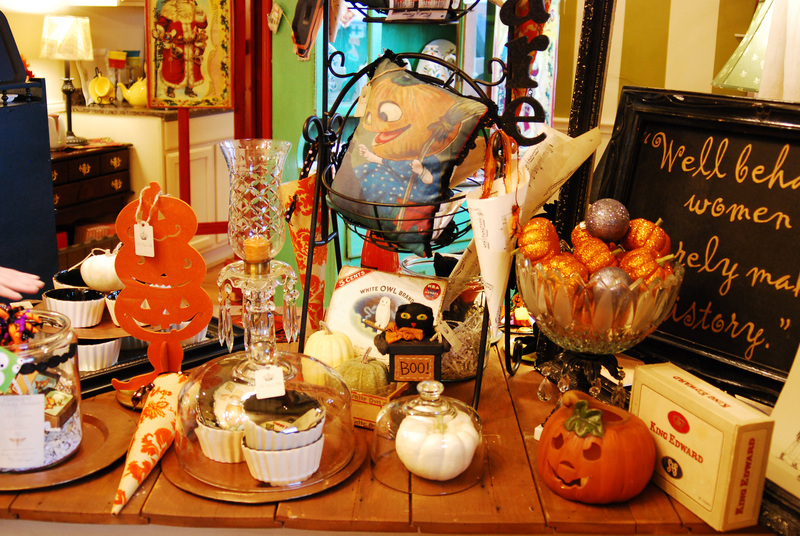 Since we were there before Halloween Kristina had a wonderful selection of pieces for the holiday as well. 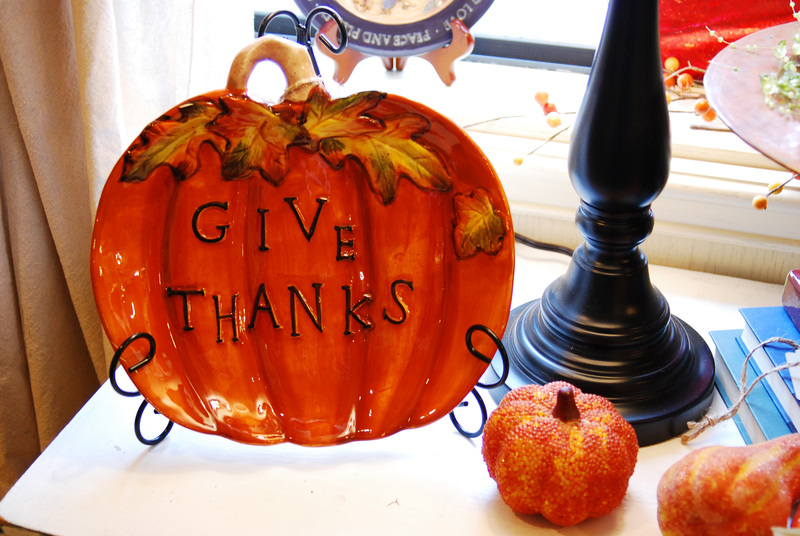 Don’t you just love this Thanksgiving pumpkin? Yeah, me too, so now it’s sitting on the window sill in MY kitchen. And here’s the kicker. Her prices are ALL very reasonable! Her philosophy is that she wants to have a constant turnover of fresh merchandise so she plans to have items priced to sell. That way she’ll have room to infuse her creations into the shop in addition to other treasures that she’ll discover and offer for sale. My only disappointment was the size of the shop. I’m afraid she’ll run out of room for all the great items she has. Good news is that they have more space in the back or they could convert the current office for more display space, so hopefully if the shop does well they can expand without having to move. Can you tell from Kristina’s face below how excited she is about her new endeavor as she stands under the crown on the doorway? She’ll be just as excited when you walk through the door for a visit. The store is open on Thursdays, Fridays and Saturdays for now. Call for hours. Tell her that Nancy sent you! 7273 E 1st St, Prescott Valley, AZ 86314.